Since Covent Garden ("CG") is a quite interesting piece of work, I would like to give a brief history of that organ in the following. Even nowadays You will see CG virtually when visiting Ian Alderman´s website www.barrelorgan.org - it´s the golden and red coloured organ on the "flying noteband"! 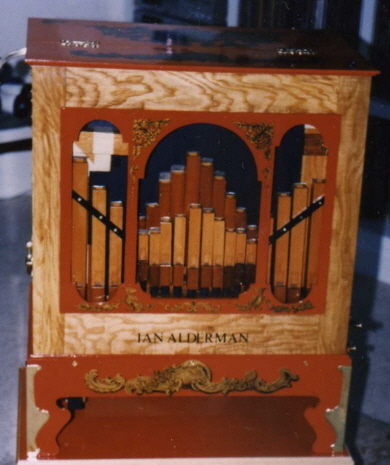 Ian Alderman and Roy Davies built CG as a 20-noteband organ about 20 years ago (First Photograph by courtesy of Ian Alderman). 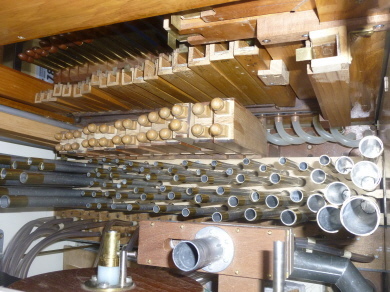 As Ian told me, it was originally laid out as a 20 with three ranks of pipes and it had 8', 4' and 2' , but it afterwards was extended to 26 notes by the builders because the owner decided to expand the ranks. 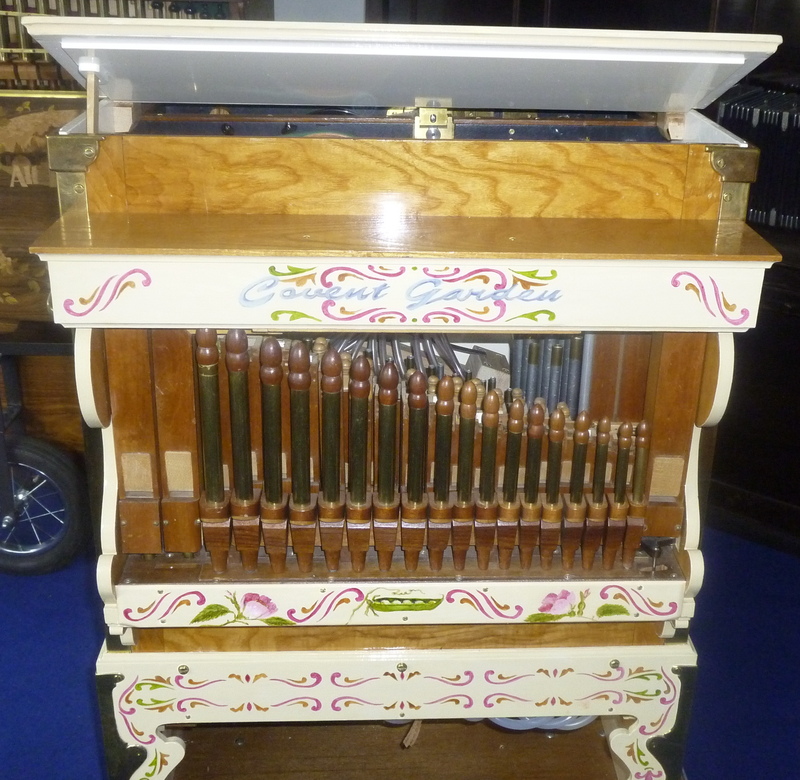 That owner was Derek Jones, well known organ pipe builder in England and abroad, from Norfolk. Derek as a professional metal pipe builder added an enormous amount of pipes, which now form three more ranks. That added pipework is really unique and quite exquisite. After adding those further three ranks Derek also had to rebuilt the complete action of the organ, which nowadays can be seen as his work. Since he was a fine craftsman that action also is made very good. The layout of the pipes as Derek transformed it is shown in the third picture. Maybe You´ll notice that even the bottom music was turned by 180 degrees and rearranged again to place the additional pipes (ref. Picture 2)! Derek unfortunately died in 2006 before he could finish his job on CG in full. Afterwards Dennis B. bought CG from Derek´s widow Joyce and completed the works with the help of his professional organ builder´s friends. Since the old casework was damaged during the modifications Derek made, CG was cased new and since all of the actors where aware of what Covent Garden should mean - not the opera, but the fruit and vegetable market - it was decorated in that theme as You see on the second picture. 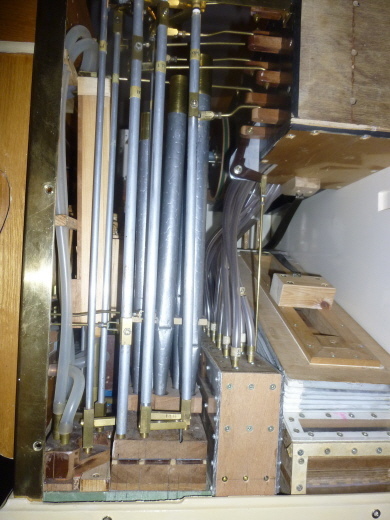 Helga and me are quite happy with CG as our "English organ" - even if You have to give a very good look to the bellows and the stops You´re playing, because CG tends to feeble due to the lot of responding pipework. In fact, in our correspondence Ian expected that to be a little bit difficult without a bigger wind supply but I still refuse to rebuild that organ for a fourth time. It´s unique sound is fascinating and I still think this to be all of their builders intention: On organ "recalling the sounds of classical English chamber organs" as Ian Alderman wrote to me - that´s what it was build as and in our opinion still is.